(Natural News) If there is anything garlic is most known for, it is its very distinct aroma and flavor. But this diminutive vegetable packs a lot of health benefits and is, in fact, one of the most powerful natural medicines and functional foods on the planet. Garlic (Allium sativum) has been used by humans since the early parts of history. Aside from its place in the ancient Egyptian’s daily diet, particularly among the working class, it also held a venerated place as a medicinal herb and functional food. It was thought to imbue and maintain strength for greater productivity. Such was its value that cloves of garlic were found preserved and buried with the infamous King Tutankhamen. Allicin is garlic’s active ingredient. It is a compound that contains sulfur and is responsible for garlic’s pungent smell and strong flavor. It is also what makes the vegetable extremely potent as a medicinal herb. There have been many studies detailing the health benefits of garlic. A lot of research revealed it effective against infectious diseases, some of the top killers in poor, developing countries. One study published in the Journal of Medical Microbiology indicates that garlic is effective against Staphylococcus aureus, even those strains that are resistant to methicillin, an antibiotic. S. aureus is normally harmless or causes only minor infections, but in people with weak immune systems, they can cause potentially fatal staph infections. Another study found that garlic can fight both multi-drug resistant and non-multi-drug resistant Mycobacterium tuberculosis, the pathogen behind tuberculosis (TB). Although TB is generally well-controlled in developed countries, it remains a disease of considerable risk in poor populations. Moreover, the use of conventional chemical medications has led to the development of multi-drug resistant strains of M. tuberculosis, making the disease a lot trickier to treat in many instances. But garlic is effective not just against bacteria, but also against disease-causing fungal species. Several studies have looked into garlic’s benefits against Candida albicans, a yeast-shaped fungus that causes yeast infection, as well as several other types of infection. The nature of Candida makes it difficult to treat using conventional medication, but garlic was found to be effective against it. This was confirmed by another study which found that garlic can help prevent thrush, a condition that occurs when Candida infects the mouth and throat of infants. Other studies have found benefits against viral pathogens, such as HIV-1, and infections, including herpes and the flu. Cancer and cardiovascular disease are among the top killers in developed countries. Garlic has been shown to have benefits against these two groups of conditions as well. One study suggests that garlic can delay the formation of plaque in the blood vessels, effectively retarding the progression of atherosclerosis. Vascular plaque constricts the flow of blood and is one of the leading reasons behind heart attacks. Another found that garlic has hypotensive properties. Hypertension or high blood pressure is one of the leading factors behind heart disease. It can also lead to damage to different organs, among which are the kidneys. Garlic has also been found to have antioxidant properties that protect the cells from oxidative damage. It prevents abnormal clots that lead to stroke and heart attack and helps modulate the level of lipids in the blood. The vegetable has the ability to kill different types of cancer cells. Several studies indicate benefits against two of the most common cancers in women – cervical and breast cancer. It can also help against liver cancer, one of the deadliest types of cancer. Studies show that it can also fight colon, blood, skin, and pancreatic cancers, among others. 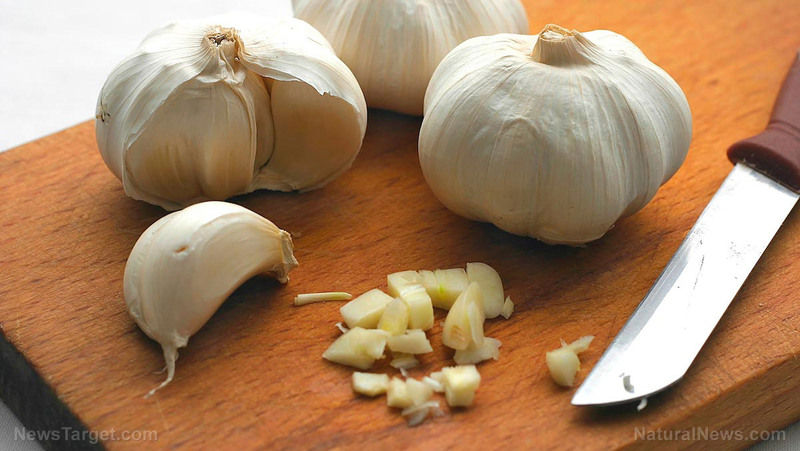 Learn more about the different benefits of garlic at FoodCures.news.